10 Great Authors, 10 Unforgettable Adventures. With every “Today’s Adventure” post between August 1 and August 13, you can register to win the featured book and the grand prize of all 10 books. We’ll announce winners on August 14. You may enter today’s contest at Lauren’s website, http://www.laurenwillig.com/news/contest.php , OR by liking her Facebook page, https://www.facebook.com/LaurenWillig. Find links to all the authors below–follow any of them to keep up with the latest adventures. It’s 1999, and my modern heroine, Clemmie Evans, is looking around her own life—endless work at a law firm where she’s hoping to make partner, a studio apartment she’s never properly moved into—and realizing that she doesn’t entirely like what she sees. As she starts to dig into the life of her grandmother, she feels shamed by the dramatic changes her grandmother encountered and mastered: the twilight of the aristocracy, two World Wars, a move from London to Kenya and then from Kenya to New York. Of course, Clemmie doesn’t know the whole story. As the book opens, we meet her grandmother Addie in 1926, on a train from Mombasa to Nairobi, stained with sweat and dust, wondering what on earth she’s doing, leaving her flat, job, and fiancé back in London to travel halfway across the world to visit a cousin she hasn’t seen in five years, a cousin who was once her closest friend and then the source of her greatest tragedy. Both women, one in 1926, one in 1999, are about to embark on journeys that will change their lives, journeys both physical and emotional. Perhaps adventure—real adventure—always begins by accident…. 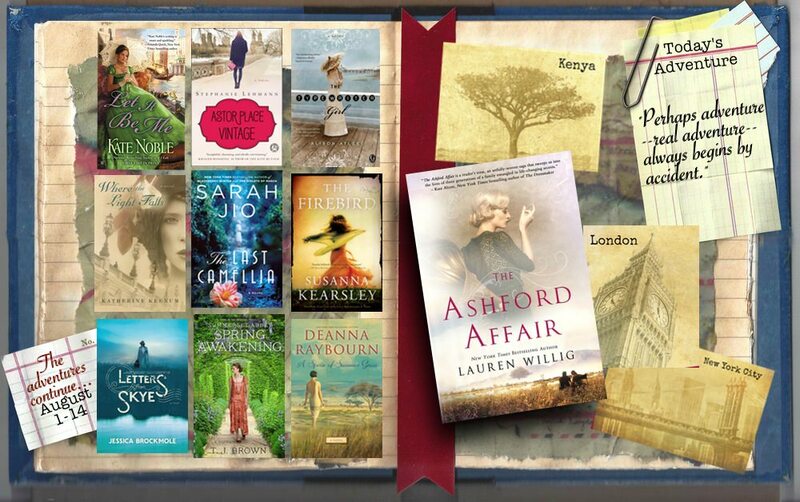 To learn more about THE ASHFORD AFFAIR, visit my website at http://www.laurenwillig.com/books/ashford.php, where you can find the Prologue and first chapter of the book. There are two ways to win a signed copy of THE ASHFORD AFFAIR! You can pop by the Contest page on my website (http://www.laurenwillig.com/news/contest.php) and enter there OR like my Facebook page, https://www.facebook.com/LaurenWillig. I’ll be picking one winner from each.